Kim Hollis: Whether you agree with them or not, most media reports are describing Straight Outta Compton as over-performing. 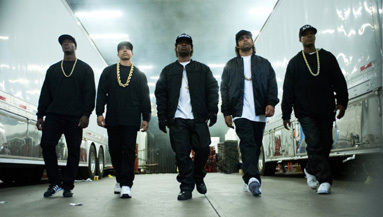 Where does Straight Outta Compton rank amongst 2015 box office surprises/successes? Jason Barney: I think we will have to wait and see until the end of its run. At this point it is one of the true surprises. I don't think it is up there with Jurassic World, but it’s big. Edwin Davies: I don't think it was a completely out of the blue success because the film had a lot going for it, but the extent to which it has caught on with audiences thus far says a lot about what can happen when quality and a strong subject matter are boosted by something harder to predict like social relevance. I would say that it was not as big a surprise as the success of Jurassic World or American Sniper, which both blew away even the most positive expectations, but in the same ball park as Fifty Shades of Grey, in that a film which looked like it could do well exceeded expectations by a decent, but not impossible, margin. Felix Quinonez: I definitely think it's a very big surprise. And if it holds up well, I believe, it could be among some of the year's biggest box office stories.